One of the projects I’ve worked on at Emory is now live. The Turner Cassity Born-Digital Collection presents drafts of poetry from the born-digital materials in the Turner Cassity Papers, held by the Stuart A. Rose Manuscript, Archives & Rare Book Library at Emory. The born-digital materials in his papers come from his computer, a Compaq Presario SR1222NX. The project is built with Omeka, and is unique in that it makes born-digital archival materials from the Rose publicly available (possible through permission of the literary estate). Normally this type of material is only available in the reading room. The exhibit “Places in Cassity’s Poetry” explores how DH methods might be used to explore born-digital archival materials. The site also makes plain text files available for download for personal research use. 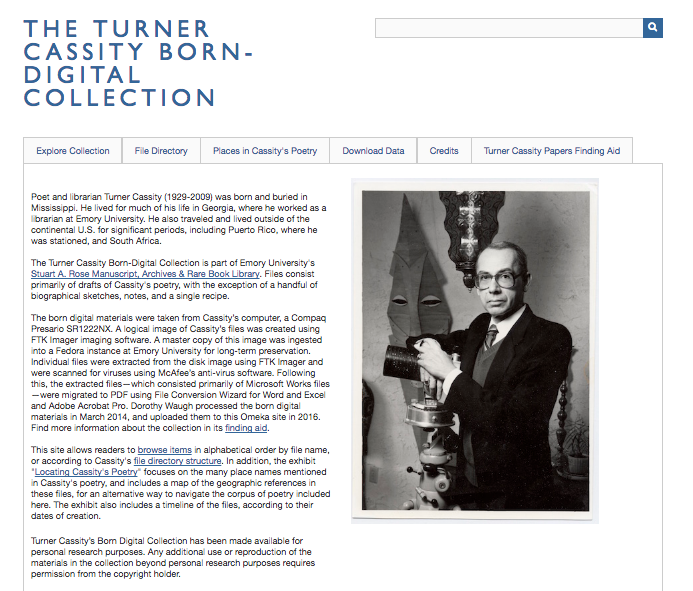 The Turner Cassity Born-Digital Collection website.